If you are working in paid employment, you should, around now, be receiving your 2012 P60 Certificate. 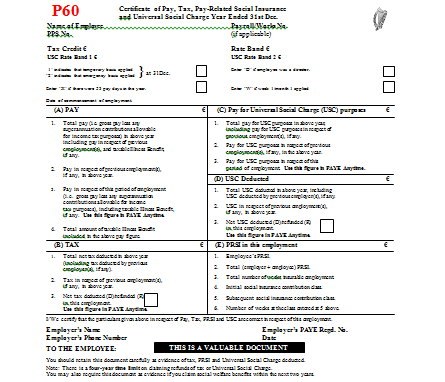 Your P60 is a Certificate of your annual Pay, and PAYE Tax, PRSI & USC deductions, for the past calendar year. Your employer is legally obliged to issue you with your 2012 P60 by 15 February next, but you may well have already received it recently. Your P60 is a very important document and it is essential that you keep it in a safe place. if you are completing a tax return, or making a tax refund claim for 2012. Revenue may sometimes also require you to forward your P60 to them in order to verify your tax return or claim. if you are making an application for a mortgage or loan, to a bank, credit union or building society. as proof of your income if you are claiming certain benefits from the Dept of Social Protection. for a variety of other State benefits, eg SUSI Third Level Grants. In addition, I recommend that you retain all your old P60s indefinitely, in case you need them in the future to verify your PRSI contributions history. This can be especially important for eligibility for the Contributory Old Age Pension. If you don’t receive your P60 by 15 February next, you should ask your employer to issue it to you, without further delay. They can do so either via payroll software, or by using the Revenue approved-format P60 templates, which are online in both MS Word and Laser format (the latter presumably for use with laser printers). article on ouur site. Keep up the good writing. What i do not realize is in reality how you’re now not really much more smartly-preferred than you may be right now. this topic, made me in my view believe it from numerous varied angles. floor the same way. They may be able to work with you to find an arrangement that you are happy with. of clever work and reporting! Keep up the good works guys I’ve added you guys to my own blogroll. Marvelous, what a webpage it is! This web site presents useful facts to us, keep it up. Good response in return of this issue with genuine arguments and describing the whole thing about that. are talking about! Bookmarked. Please additionally seek advice from my web site =). in my diary every day. I’d like to start a blog so I can share my personal experience and views online.